Heat 2 tsp oil in a pan, splutter mustard seeds and add curry leaves. Add sliced shallots and saute well. Then add chopped carrots and broccoli, stir well and cook for 2 minutes. Add turmeric powder , salt and 2-3 tbsp water, mix well and cook in low flame for 5 minutes. Superb! so simple but very healthy side. i cooked this combo just now...it was delicious...good thoran.. 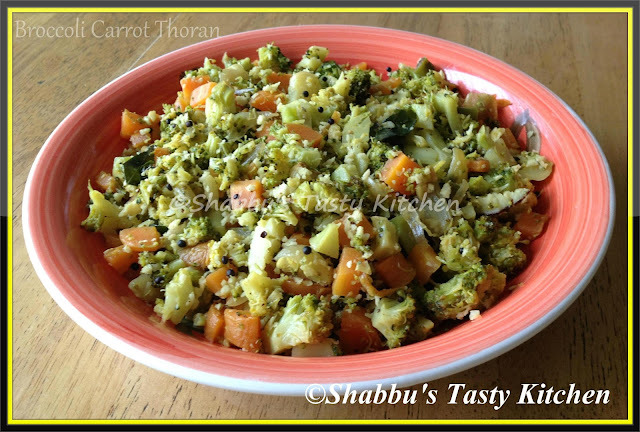 Very healthy and delicious thoran. Delicious and very colorful too..
Nice and interesting combination both color wise and taste wise..
Nice combo and healthy too.